This year let Krishna.com show you how to celebrate Janmashtami with your family by getting together in the kitchen to make delicious snacks. Kids of all ages will enjoy making these easy and fun recipes with the help of their parents, and everyone will learn how to offer them to Krishna. Kids like things that are easy to make and fun to eat. Don't try to get the children to make the whole meal the first time out. Let them concentrate on the dessert or a salad. 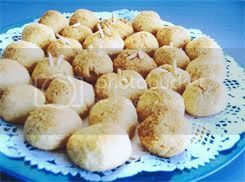 The kids can also help make the snacks you might share with friends over Janmashtami. The fun can start early. 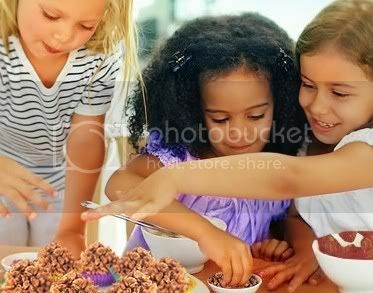 Let the kids take part in choosing the recipes they will help make. They can look through recipe books, or you can tell them the recipes you know about. Remind them that the food is for Krishna and you are making it to celebrate Janmashtami, His appearance day. You might even read to everyone from Prabhupada's book Krishna or from Canto 10 of Srimad-Bhagavatam. You could also take the children along when you go to the market to purchase the ingredients. They can help with selecting the right things and with bringing them home to the kitchen. This way the kids will be able to see how all these activities are carried out for Krishna. There are plenty of safe things kids can do in the kitchen. If they are too young to take on a whole recipe, they can be assigned small tasks, like helping to collect all the ingredients. The older kids can help wash and peel, while the younger ones can help with stirring and mixing. You need to pick safe recipes like salads, drinks, and easy sweets so the kids can really play a part. Cool or cold recipes are the best, and tasks that don't require sharp knives are safest. It's always best to make a plan. Here are some recipes you can use to get the kids involved in Janmashtami. The will love to offer devotional service by making some delicious food and offering it to Krishna so it becomes prasådam and can be shared with friends and family. 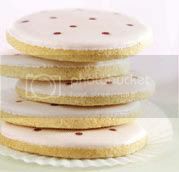 Click on the pictures or the links below to find the recipes. Coconut balls taste great, and kids will love making them. They require no heat, just a refrigerator. They do, however, make for sticky fingers. This is a very simple recipe, and you can add your own touch by including your favorite textures and flavors, like orange peel, dried fruit, or chopped roasted cashews. Keep a bowl of warm water and a cloth handy to wipe those sticky fingers. 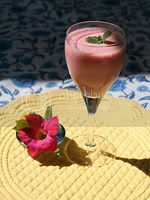 This Strawberry Dreamer Drink is cool, tasty, and refreshing. It's also very easy to make. This drink is so nice you will have to remind the kids that when we are making food for Krishna we don't keep tasting it at every stage. We let Krishna be the first to taste. 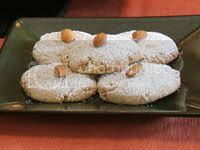 A hot oven is required to make these Almond Cookies, but everyone can learn to use the oven carefully so that Krishna can enjoy some almond cookies on His birthday. Make sure you have an oven glove so you can show the children how to move things in and out of the oven safely. 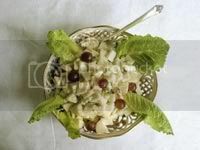 Cool and crunchy Waldorf Salad. This is usually a big favourite. It is a naturally sweet recipe that appeals to kids and adults alike. There is some chopping of nuts, apples, and celery required. This should be a supervised task. The best way is for everyone to do it together at the beginning so all can concentrate and there are no other distractions. Sugar Cookies! Here we need a hot oven again, but again it is really worth it. The kids can help with all the mixing and stirring and using an oven glove, and then can place the cookie trays in the oven. Parents are needed to get the trays out and keep them safe until the cool. I'll bet Krishna loves cookies. The best way to offer food to Krishna is to have a set of dinnerware that you keep separate, used only for Krishna's offerings and not used by anyone else. Place the plate in front of a statue or picture of Krishna and ask Him to accept the offering. The simplest way to offer food is to chant the maha-mantra: Hare Krishna, Hare Krishna, Krishna Krishna, Hare Hare/ Hare Rama, Hare Rama, Rama Rama, Hare Hare. (There are also prayers one can chant. See below.) Leave the plate there for a few minutes for Krishna to enjoy, just as you would if offering food to a friend. After a few minutes, you can remove the plate and transfer the food to a serving plate to share with everyone else. Then you can wash Krishna's dinnerware and put it away for next time. The food is now prasadam, or "mercy" from Krishna. While you eat, you should consider the spiritual value of the food you are taking. Because Krishna has accepted it, the food is now spiritually identical to Him. Therefore by eating prasadam you become purified. Everything you offer Krishna becomes spiritualized prasadam--flowers, incense, water, food. All prasadam should be respected and shared with others. Spread the mercy around.